Hyundai’s new Genesis Coupe already gets everything right, but it just keeps getting better for tuners. Their latest announcement says they will be releasing a Genesis Coupe R-Spec, which is basically a blank slate for tuners and racers to go to town, or leave as-is. The R-Spec starts off by getting rid of a few of the standard, non-essentials: Bluetooth, auto headlights, cruise control, trip computer, chrome interior accents and steering wheel audio controls. Then they add some fancy go-fast parts, which will surely excite those of us who want to take the car to the track: Track-tuned suspension, 19-inch gunmetal alloy wheels with performance summer tires, Brembo brakes, limited-slip differential, and R-Spec badging. Unfortunately, the R-Spec will only be available in black, white, or red. The R-Spec will include the 210 horsepower, 2.0-liter turbo engine and 6-speed manual transmission. An automatic trans will not be available, but why would you want it with this anyway? The low-pressure turbo engine gets 30 mpg on the highway and hits a top speed of a mediocre 137 mph. All Genesis Coupes including the R-Spec come standard with Electronic Stability Control, Traction control, ABS, Brake-Force Distribution and Brake Assist, much like Toyota’s Star Safety System. So we have a base Genesis Coupe, stripped of a few non-essentials, and fitted with some track parts. What a clever approach Hyundai is taking to reach out to tuners. The R-Spec will cost an incredibly reasonable $23,750, which is $1,750 more than a base Coupe and $3,000 less than the 2.0T Track model. On a side note, I hope some of the parts they removed are optional; I’d still want cruise control and a trip computer, for example. 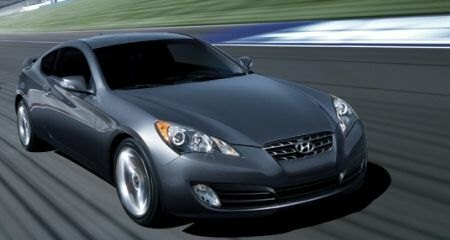 So you buy this blank slate Genesis Coupe ready to tune – now what? Well, seeing as how the turbo is being described by Hyundai as “low pressure,” the first thing I would do is boost the PSI to the highest possible safe pressure. There’s also been a lot of talk about how the ECU will be tuned, which will be something I hope Hyundai thought about a lot. After that, you can likely start with the normal stuff – air intake, custom exhaust, etc. It already has great Brembo brakes, 19-inch wheels, a limited slip diff, and a tuned suspension, so no need to worry about that at first. It will also be interesting to see what sorts of body kits show up for the Coupe, although I don’t think it needs one. The real question is whether or not Hyundai themselves will provide these performance parts Scion-style, or if they’ll leave it all up to third party companies. Providing their own would be more expensive for us, but would give us some reassurance with no voided warranties and the guarantee they’re installed correctly. Regardless, I think Hyundai is doing a fantastic job with the Genesis Coupe, and pending a test drive, it might be my next car. Based on the numbers, specs, and looks alone, they’ve hit all the nails on the head here, and the R-Spec is a great idea despite the fact that they could have done it a better way. I just wish they would offer the orange color shown on the Genesis Coupe Concept. Look for a review of the Genesis Coupe here in the near future, I’m waiting desperately for it to show up on our review car schedule. 3 Comments on "Hyundai Gives Tuners a Blank Slate with the Genesis Coupe R-Spec"
Considering that the Accent has a short-throw shifter, cold-air intake, and anti-roll bars available from the dealership I'm gonna guess that there will be plenty of purchasable go fast goodies for it. I personally can't wait to see it in person in Toronto at the auto show on Monday. Nice write-up Chris and some good insight… It's possible that Rhys Millen Racing will be providing some parts in the future as well.. Thanks for the comments guys, I can't wait to see how Hyundai handles this.